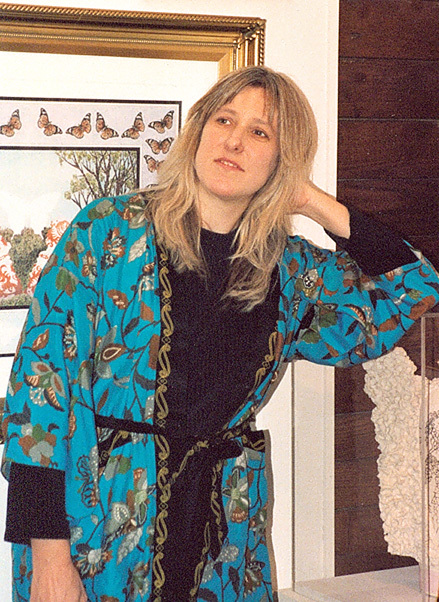 Lise was chosen to be Artist of the Month (March) at the Lower Adirondack Regional Arts Center in Glens Falls, NY. An exhibit in their Lapham Gallery and a web interview with pictures and soundclips ensued. The web interview can be found here. 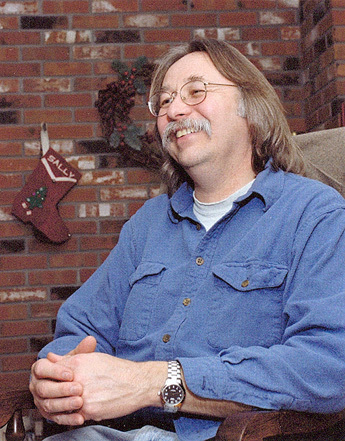 Lise was a featured artist on Whole Wheat Radio ( Talkeetna , Alaska) on December 9, 2006 where both the Come to Me in Dreams and The Goldenrod albums were played. 5. Westside Gallery (group exhibit, October 2005 – April 2006). The Art Center of the Capital District, Lower Adirondack Regional Arts Center, Aimee’s Gallery (Ceramics Exhibit), Mohawk Valley Center for the Arts, Kismet Gallery, The Small Gallery at Hubbard Hall and Fulton Street Gallery members’ exhibit (December 2006 – January 2007). New galleries included Clay Horse Pottery in Little Falls, NY; Kismet Gallery in Troy, NY; and Mimosa Gallery in Saratoga Springs, NY. Lise’s role as curator for Fulton Street Gallery in Troy, NY was a Fiber Arts Invitational Exhibit that ran from September 1 – October 7. More information about the exhibit and artists can be found here. Since the year has just begun, I begin this year’s web diary talking about experiences of the last few months as well as events of the last year. From January through May, my focus was primarily on visual art. From May until the end of the year, the focus was primarily on music. For the visual art part, I spent a good deal of time making pottery and went to see throwing demonstrations and slide lectures by Steve Branfman and Julia Galloway. Julia was especially inspiring not only for her beautiful objects and spunky character, but because she makes functional ware, sometimes frowned upon in academia, especially during the years when we went to school (we both attended college and graduate school at the same time during which the Soldner/Volkous period influenced everything in all of the major art ceramics departments). I always admire artists like Julia who can challenge trends and conformity by sheer talent. Last summer I also sewed some new ren-costumes (like the majority of ren-performers, I do make the costumes for the band). It is a time-consuming project because of all of the ruffles, the grommets, the gatherings, the embroidery and other aspects of this kind of costume design. I also do it because, like pottery and drawing, it is another creative outlet for me, a chance to put certain visions and ponderings to work, to complement the sound of the band with something visual as well. But, as with our unconventional sound, I am not a stickler for authentic attire. It would be extremely difficult anyway with machine-made fabrics and the fact that many tapestry-type fabrics which are used for most of the ren-outfits one sees at ren-faires have liberal doses of polyester and rayon in them—relatively new inventions—not to mention all of the other modern treatments: usually sewn on machines, using 50/50 thread, with machine-made grommets, polyester elastics, cotton underclothes, 50/50 bias tape, and so on. At our concert at the Inlet Fall Festival, we ran into one of our fellow Killington ren-performers, Jack of All Trades (ala, Steve Gratto)! His show was a little different than at the faire and included microphones, music and modern attire. But, then again, our show was also quite different. We talked briefly about banding together for performances. If you would like music and a juggler/stilt-walker/tight-rope walker/unicyclist/outrageously fun showman for your party, school event, etc, you can always e-mail and we’ll see... Denote period costumes or contemporary attire. My research was varied and wide last year and included such topics as Renaissance period songs from Wales, Ireland and Scotland, computerized kilns, digital printing, owls, the history of traditional ornament, birds of prey in North America, the history of playing cards, log cabin quilt designs and a number of poets. Expect some new directions and changes, both in my visual art and music. Jim Lestrange and I also attended James Howard Kunstler’s book signing of “The Long Emergency”, a book about peak oil and the converging catastrophes of the 21st century. A prelude to what the book is about can be found in a Rolling Stone article here. Some of what it said inspired both of us to start a vegetable garden (and indeed, we went overboard and had more vegetables last summer than we could eat, can or freeze without devoting all of our time to this activity!). Mr. Kunstler also gave Jim some wonderful accolades about his computer business here. Jim is my website designer, and is a musician in both the bands I play in. Jim was also a member of the band, “Skuttlebutt”, until recently, when in September they decided to disband. John Cromie, the very talented whistle player from that band decided to join Saratoga Faire for Irish/Celtic concerts. 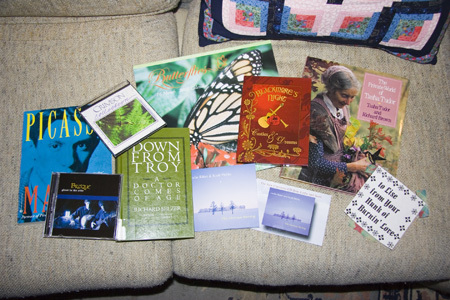 Thanks again to those of you who send your encouragement, for attending concerts and buying CDs and art. It all helps to keep me motivated, to be inspired, to be grateful, and to think about what the world might need in general, and from me in particular. I hope the new year brings positive change, peace and more reverence for our planet and for the lives that inhabit it. 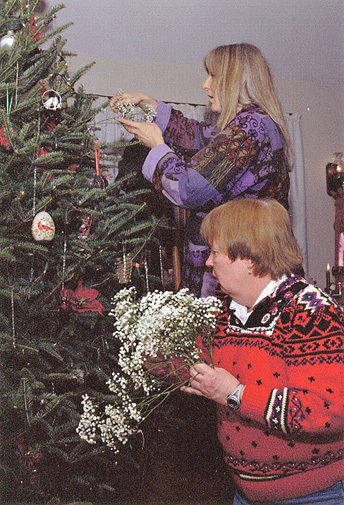 From left to right: (1) with my friend, Sally, on Christmas Eve helping to decorate her tree with baby’s breath, (2) Jim Lestrange in a cheerful mood, (3) at an art opening. (Photos 1 and 2 by John Cromie). A picture of some gifts I received over the holidays. I’m enjoying these so much! People around me know me pretty well, I think. Some people have e-mailed me and complained that they can’t make out what a lot of these items are. So I will list the items, and since I have had a chance to experience them all, tell you what I think of them. Please don’t consider my thoughts to be a formal review; they are just feelings/views/perspectives about items that I was in a pre-disposition to like/enjoy because they were gifts and based on my general interests. These are folks I record with, so I was anxious to hear their latest release. They are always a class act and won two Just Plain Folks Music awards for best Christmas album (second place) and best traditional song (first place for The Bells of Christmas) after 3 nominations and 25,500 albums submitted to the contest. Leslie’s voice is especially striking and soulful on this album (one reviewer described it as “a caress”). The production is spare, so her voice and what she is saying is very much the focal point. The lyrics, as in their other albums, focus on the spiritual. The gem on the album is “If Mary Knew”, an original taken from Mary’s perspective, and is as much of an Easter song, or a universal Christian song as a Christmas Carol. given to me by a twelve year old girl because she knows I spend many hours drawing butterflies and am enchanted by their large feather-weight wings on top of their small slender fragile bodies, their beauty, their grace, the way they live, survive, flutter around everything. The other part of this gift was going to a butterfly sanctuary. A butterfly calendar in a prime spot in my home is always a wonderful reminder of their presence in the world. This is a concert DVD. Since I had expressed a desire to see this group perform and had not been able to, this present was given to me as a response. I started following Blackmores Night since their first CD, when I saw an article written about them in a guitar magazine. At the time I was ensconced in my own recording project of Renaissance songs, rendering them in the way I wanted to hear them. Realizing that these folks were trying to do something vaguely similar, finding their first CD was of paramount importance to me. I have been following their career ever since. When we watched the DVD, late on Christmas night after everyone left, we were struck by the fact that Candice reminded us, in appearance and disposition, of our friend, Rachel, owner of the Killington Renaissance Faire where our group performed for a couple of years. I enjoyed the uniqueness of the music, the superb musicianship (and watching the guitar athlete!) and Candice’s warm and fun delivery. It was wonderful to see Tina Chancey’s playing too (whose career I have also been following). About a boy coming of age in Troy, NY. Written in a flowery, almost poetic language about being the son of a physician. The author was inspired to become a physician himself. This was Troy in the day when doctors lived in the heart of the city, saw patients on the first story of a row house as needed while the family tiptoed around upstairs, and when trains, boats and horses were a major mode of travel. The author's mother was a professional singer and sang at Troy Music Hall on a regular basis. This was the day when a talented singer wasn’t required to travel huge distances in order to work and where an area’s local musicians were called upon regularly to entertain the public (a public who actually left their houses to be entertained!). About Picasso’s youth up until the First World War. Takes Picasso through several stages: youth paintings, finding a style, the Blue Period, Rose Period, Les Demoiselles d’Avignon, Analytic Cubism and Synthetic Cubism. From Spain , Picasso settles in France and lives the bohemian life: poverty (sleeping in his studio with paints and turpentines, newspapers for a table cloth, occasionally without a studio or place of residence), drugs, drinking, brothels, orgies, a 7 year live-in affair with a beautiful woman named Fernande, and a host of writers and artists who influenced him. I did a huge paper on Picasso in college (which my professor liked) and this added to the body of knowledge. Even so, I’ll never really entirely understand Picasso except for his tremendous drive to create, his ambition to explore new ways of seeing and painting and his ability to put up with many, many years of poverty, scorn and dismissal to push his vision through. I had given this book to my mother and then this same book was given to me because I liked it so much. When I was unwrapping it, my mother remarked that I reminded her of Tasha (already?). What’s not to like about this book? She is a painter, a puppet-maker, story-teller, a gardener, a cook, a lover of animals and lives a full life as if she were in the 1800s. Her quotes throughout the book are priceless and the photographs are stunning. I discovered Kaur’s and Robertson’s “Guru Ram Das” CD many years ago and took it wherever I went where remaining calm, peaceful and focused on the higher purpose became essential (Garden State Parkway, hospitals, break-ups, etc.). This is another one from the series. Sing Kaur has a voice that exudes so much warmth and purpose that it seems to come from another world. And her voice is often in my thoughts when I am in situations that seem stressful. Gideon Freudman is a cellist from the Pioneer Valley area of Massachusetts where he is a bit of a star. My father gave this CD to me in response to my own cello playing (pretty rudimentary). Gideon’s style is innovative and he is a pleasure to watch when he performs. “To Lise from Your Hunk of Burnin’ Love”: one of the tags that my sweetie printed and attached to one of the gifts.